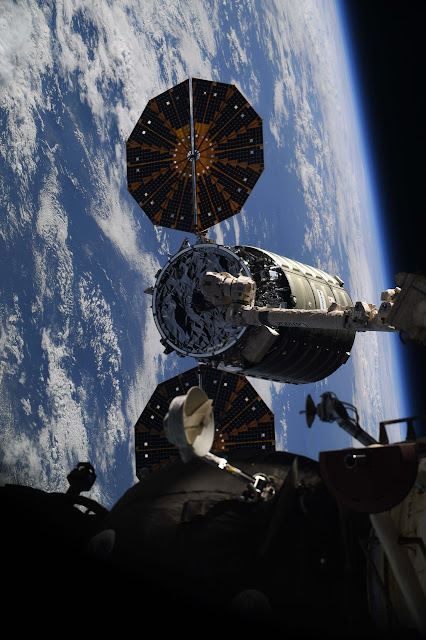 Expedition 56 Flight Engineers Alexander Gerst of the European Space Agency (ESA) and Serena Auñón-Chancellor of NASA commanded the International Space Station’s Canadarm2 robotic arm to release the Cygnus cargo spacecraft at 8:37 a.m. EDT on July 15, 2018. At the time of release, the station was flying 253 miles above the southeastern border of Colombia. Earlier, ground controllers used the robotic arm to unberth Cygnus. The departing spacecraft moved a safe distance away from the space station before deploying a series of CubeSats. Cygnus will remain in orbit for two more weeks to allow a flight control team to conduct engineering tests. Cynus is scheduled to deorbit with thousands of pounds of trash on Monday, July 30, as it burns up harmlessly over the Pacific Ocean while entering the Earth’s atmosphere. The spacecraft arrived on station May 24 delivering cargo for Orbital ATK’s (now Northrop Grumman’s) ninth contracted mission under NASA’s Commercial Resupply Services contract.